Our tongues recant like beaten weather vanes. Our Meistersinger, thou set breath in steel; And it was thou who on the boldest heel Stood up and flung the span on even wing Of that great Bridge, our Myth, whereof I sing. Cowslip and shad-blow, flaked like tethered foam Around bared teeth of stallions, bloomed that spring When first I read thy lines, rife as the loam Of prairies, yet like breakers cliffward leaping! Stars scribble on our eyes the frosty sagas, The gleaming cantos of unvanquished space. Dead echoes! But I knew her body there, Time like a serpent down her shoulder, dark, And space, an eaglet’s wing, laid on her hair. You who desired so much—in vain to ask—Yet fed your hunger like an endless task, Dared dignify the labor, bless the quest—Achieved that stillness ultimately best, Being, of all, least sought for: Emily, hear! O Sleepless as the river under thee, Vaulting the sea, the prairies’ dreaming sod, Unto us lowliest sometime sweep, descend And of the curveship lend a myth to God. Slow tyranny of moonlight, moonlight loved And changed. Bequeath us no earthly shore until Is answered in the vortex of our grave The seal’s wide spindrift gaze toward paradise. And onwards, as bells off San Salvador Salute the crocus lustres of the stars, In these poinsettia meadows of her tides. The Cross alone has flown the wave. But since the Cross sank, much that’s warped and cracked Has followed in its name, has heaped its grave. 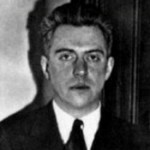 Harold Hart Crane was born in Garrettsville, Ohio, USA. He was an American poet. In his most ambitious work, The Bridge, Crane sought to write an epic poem, in the vein of The Waste Land, that expressed a more optimistic view of modern, urban culture than the one that he found in Eliot's work. He wrote several poetry books include: White Buildings, Ten unpublished poems, and The Poems of Hart Crane.